Hi all, and welcome to the 2017 Chapter One Conference Blog Tour. I am very excited to be able to host Ch1Con on my blog today and tell you all about the amazing line-up for the 2017 conference. 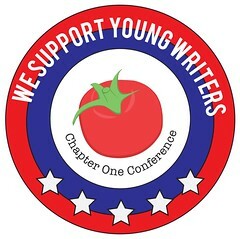 Chapter One Conference is a writing conference put on by the organization Chapter One Events, which was founded back in 2012. It is a conference entirely put on by and for young writers. The team is composed of a number of high school, college, and twenty-something writers, who work to create a unique, inclusive experience for young attendees. The conference, with its subset focus on the young adult novel, brings teens together to hear from accomplished speakers their own age, participate in professional workshops, and celebrate the influence young writers have on the world. With an atmosphere that combines the professional aspects of a conference and the awesomeness of being able to hang out with your fellow young book lovers/writers, Ch1Con is a true can’t-miss experience!!! Aren’t sold yet? Okay, let’s talk about this year’s speakers and panelists. This year, Ch1Con is bigger and brighter than ever, with more opportunities, cooler giveaways, and a new roundup of fantastic speakers headlining the conference on Saturday, August 5th in downtown Chicago, Illinois. Registration is currently open on the Ch1Con website (here) for writers ages eleven to twenty-three and at an early bird discounted price of $49.99. The speaker line up is up on the website now, featuring Kody Keplinger, author of a bevy of YA hits including THE DUFF (now a major motion picture! ), literary agent superstar Brent Taylor, and more! If you are a young writer who is struggling to find a community of like-minded peers, or if you simply want to know more about the ins and outs of writing (especially when writing at a young age) Chapter One Conference is an amazing and completely unique opportunity. I was an official attendee last year, and I truly regretted the fact that I hadn’t made the effort to go to Ch1Con before then. It was an incredibly fun experience with amazing speakers and a really entertaining, creative atmosphere. Not to mention the prizes, trivia games, workshops, and free swag. SO MUCH FREE SWAG!!! So now that I have chatted your ear off about this whole thing, I hope you really consider joining us at this year’s conference. All of the information, including location, a full list of speakers, and cost can all be found, here, at the Ch1Con website. I really hope to see (and meet) all of you there!